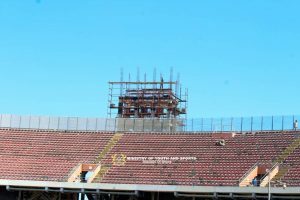 Pictures released by the Ministry of Youth and Sports on Wednesday suggest that the Accra Sports Stadium is being put in shape for the 2018 African Women’s Championships. The tournament will run from November 17 to December 1 and Accra and Cape Coast will host the 8 participating countries. 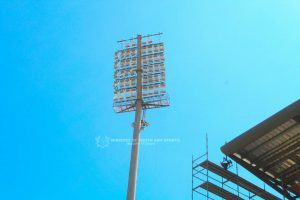 The Accra Stadium has been undergoing some renovation works for some months now and it seems that some work is going into making the ground ready for the event. The floodlights and the pitch seem to have experienced a face-lift. However, there is some way to go before it can take care of some of the continent’s high profile matches in terms of women’s football as the seats and the scoreboard need some attention. Will Ghana even host the tournament? 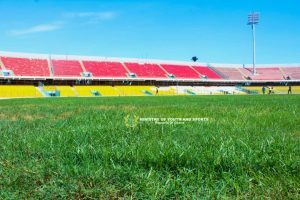 Ghana’s status as hosts came under fire in the last few weeks ago after news reports emerged that the Confederation of African Football was looking for a new host due to the slow nature of renovation works on the Accra Stadium. The Chairman of the LOC for the tournament, Madam Freda Prempeh, said that CAF had not stated anything of that sort and CAF itself said that no official decision had been taken with regard to Ghana’s hosting of the event. CAF added that a decision on Ghana would be announced on September 28 during its Executive Committee meeting in Cairo, Egypt.